shrub (seldom tree) of the family Magnoliaceae (tulip tree). Etymology: name allocated by Linné in honor of Pierre Magnol, doctor and botanist of Montpellier (1638-1715). He conceived the idea of classifying plants by families, idea which Linné improved and generalised. Origin: endemic species of Europe, dispelled by glaciations. 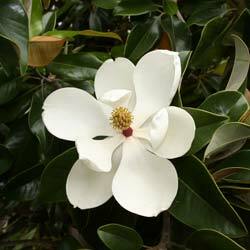 Magnolias were reintroduced from North America, China and Japan. Hardiness: zone 7 (it supports cold until -17 °C or 1 °F). Height: some species attain 25 m tall. 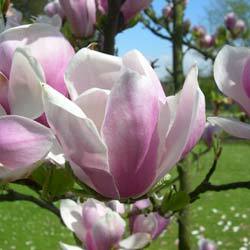 Features: There are two big types of Magnolias: magnolias with deciduous leaves, which flourish at the beginning of the spring, before the appearance of leaves, and the magnolia with big flowers, with persistent leaves and big flowers, of 20-25 cm in diameter, bigger than the previous, blosoming in summer. Their blossoming is very nice (big clear petals), although primitive (it contains many stamens and many free carpels). Their leaves are big (> 15 cm). Leaves persistent, pointed in both ends deciduous, spatulate (broader in 2/3). In 1711, the governor of the Louisiana, Roland Michel Barrin de la Gallissonière, sends to Europe the plant species. They landed in the Breton port of Paimboeuf and routed by the road to Nantes. The mayor of the city, René Darquistade, who was a fine botanist, put a sample in a greenhouse; and some years later, while the plant did not frankly develop, decided to throw it. The wife of the gardener who passed thereabouts, spoted the tree let on the manure and took it. In outside, the specimen found a second youth, for the greatest pleasure of the botanist. He hastened to entrust the analysis to the faculty of Montpellier where Pierre Magnol, contemporary of Linné and of Plumier, make the first description with François Bonamy.